The Bayou Restaurant in Mt. Vernon, NY says that it has “New York’s best authentic Cajun food!” And it was darn good for my lunch there. I went with someone who visits frequently and knows exactly what to order. Here is what we did. See their eclectic menu, click here. Cajun Grilled Vegetables. This seems like a conservative choice given how interesting the menu is. However, this was the most excellent plate of grilled vegetables I have had in a long time. The squash and the zucchini were still succulent in the middle. The asparagus retained the taste and freshness. Eating veggies has never been so tasty. 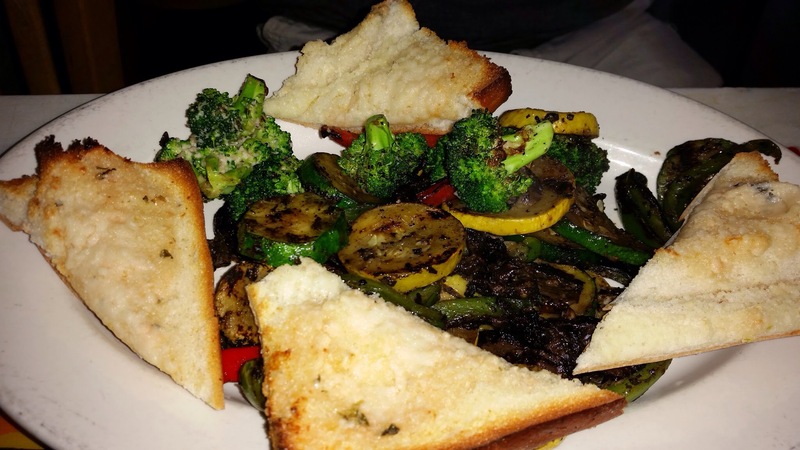 The garlic bread contrasts with the veggies’ texture well. This is a win! 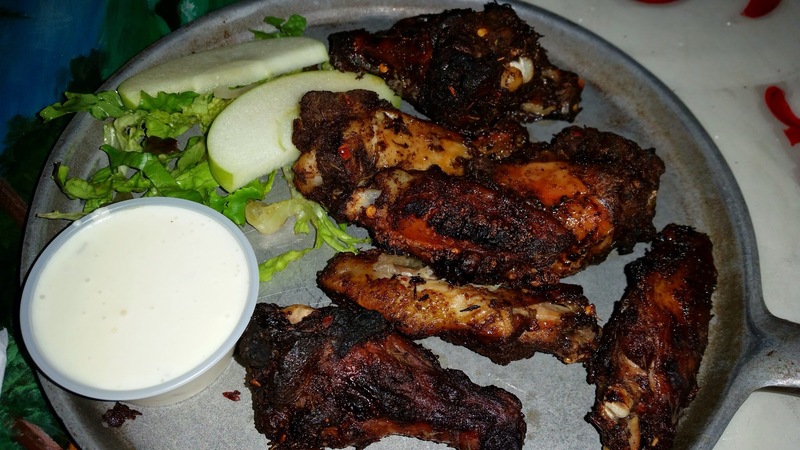 VooDoo Wings. My friend says that this is the best wings he has ever had anywhere. I agree since this is now the best non-spicy wings I have ever had. Hard to describe the spice though. It’s a blend of Cajun, American, Creole, and a little Asian. We could not put them down. Dip or not to dip? You cannot go wrong. I loved the wings both ways. Another win! 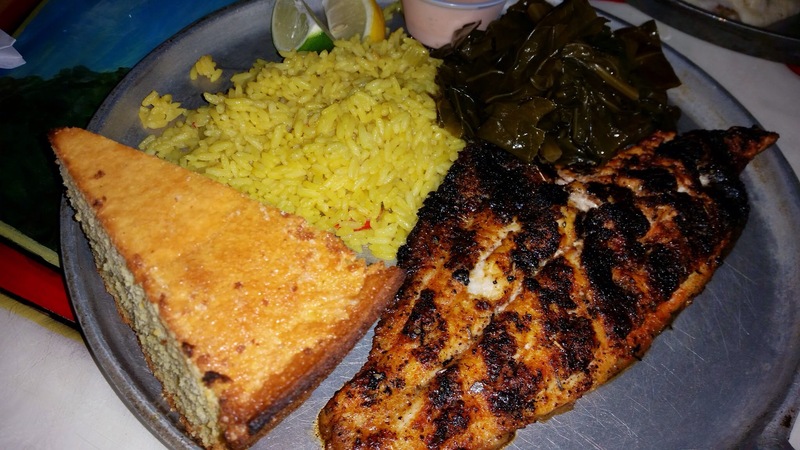 Grilled Peppered Catfish: Farm raised filet marinated and blackened to perfection served with seasoned rice & greens. I am not a catfish fan but this dish did not taste like catfish. The fish was soft, sweet, and with a smoky grilled after taste. The yellow rice was the kind that was so good that you would put five pounds on your hips immediately after you finish your meal. 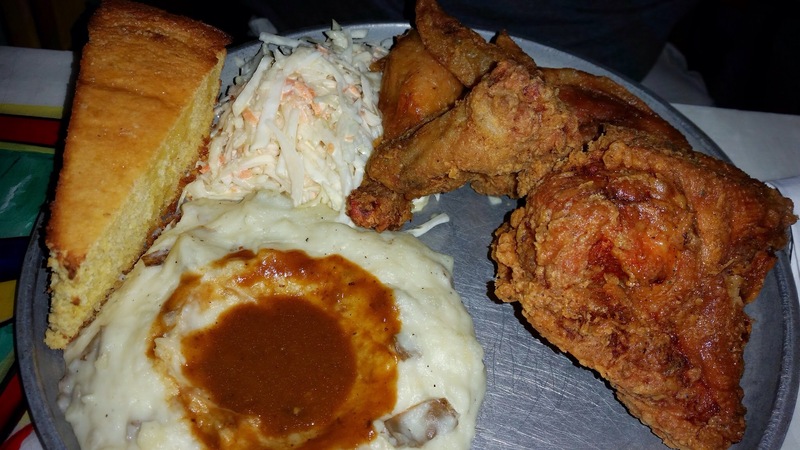 Southern Fried Kickin’Chicken: served with smashed potatoes & cole slaw. This was supposed to be one of their most popular dishes. Unfortunately, it was dry and not tasty for both the white and the dark meat. I was not impressed. I think it was an off-day for the fried chicken. Although I could not finish the tasteless chicken, I went after the corn bread with zest. The corn bread was the best corn bread I have ever had. It was so temping that I forgot I was full. I believe it was the butter that did it to me. The Bayou was decorated with hot sauce bottles, women’s bras, alligator heads, and miscellaneous old and dirty looking swampy items. The tables are a little greasy and beat up. They supposedly have live bands at night. Check out their events here. This is not my typical restaurants as far as decor goes but the food was SUPREME. That’s why there are so many “the best I have ever had” in this post. It’s not bad writing. It’s simply the truth. Highly recommend the Bayou for the food. Sounds like a great find!! Previous Previous post: Pizza Village in Montauk, NY – Awesome Homey Food Under $20!